We’re really pleased … it has certainly been a much easier process than previous years. They look fantastic. Very, very nice … and you have been very helpful in every instance. The response we had from our e-cards was overwhelming. Loved by over 16,000 businesses. 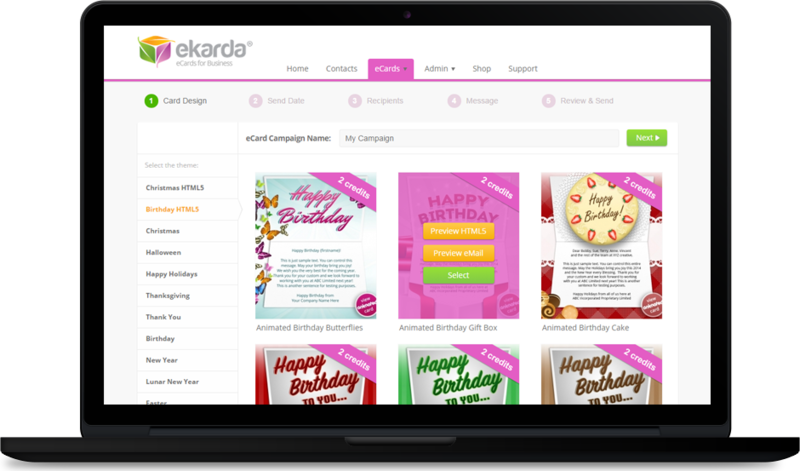 ekarda is an eCard platform designed specifically for businesses. 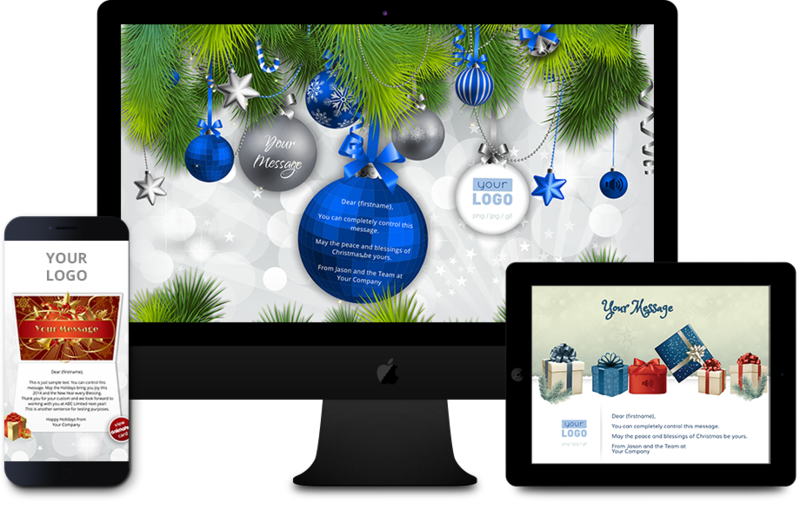 Choose a card design, add your company logo and Easter message and send fully personalised eCards from one easy-to-use desktop. 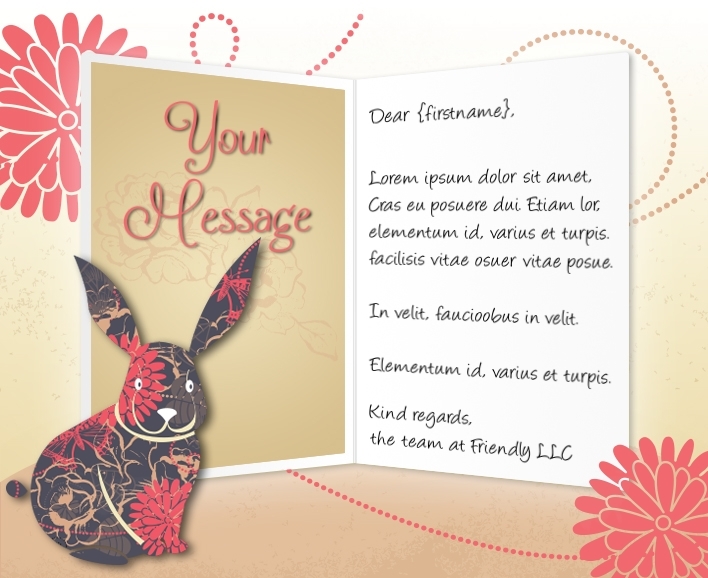 Enable any of your staff to send Easter eCards too! 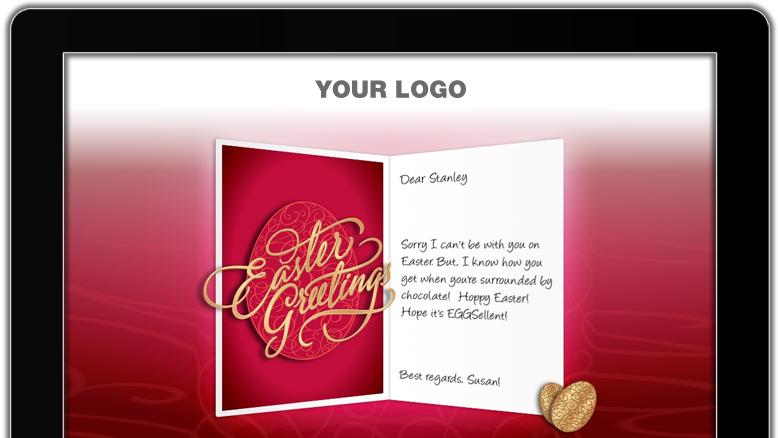 Upload one or more of your logos to an Easter eCard from ekarda’s card gallery or have a custom card designed. Authorise designated staff members to send Easter eCards to their own contacts with your choice of logos and card designs. Link your Easter eCards to social media so your contacts can share them easily. Analyse the reach of your Easter eCards via ekarda’s comprehensive reporting showing bounce and open rates for all recipients. Animated Flash eCards do not display on smartphones or tablets, but ekarda eCards work on any device. Whether your contacts view their cards at the office or while mobile, your Easter eCards will always look perfect! "Everything went perfectly, thank you so much for all your help. The cards were a hit!! ekarda has all the tools for a business to build rapport and enhance professional relationships. Whether you are dispatching Easter cards to many customers or an individual Easter card to a special contact – each eCard you send is personalised with the recipient’s name and your chosen message. ekarda’s unique blend of high-quality designs, straightforward pricing, great features & simplicity have made it the natural choice for over 17,000 companies. ekarda is the only eCard service offering full-screen eCards. We love working with our customers and we’re here & ready to help 24/5. Your contacts will love playing with your fun & interactive branded eCards. ekarda invented ‘eCards for Business’. Others copy us – but we’re still the best. 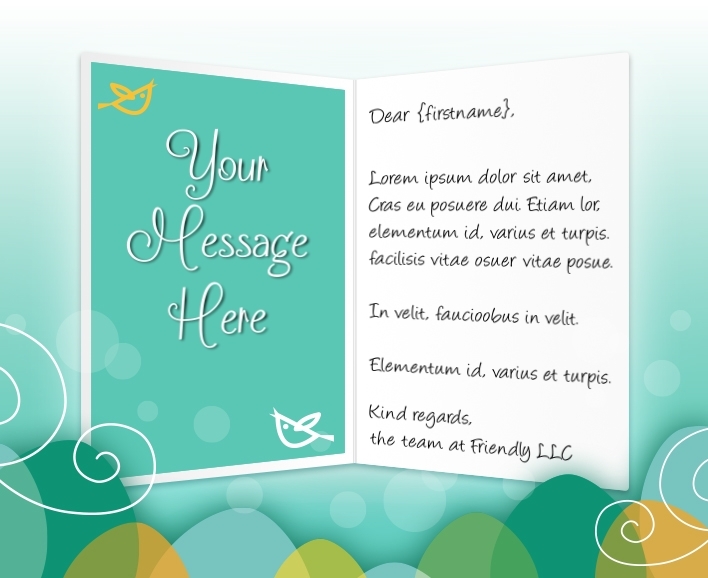 The only eCards with a beautiful HTML email that displays inside the email. Our pricing is simple & affordable and we don’t charge for ‘views’ like others. We’ve made ekarda simple with amazing features for organisations of any size. At ekarda – you get access to ALL our eCard designs at no extra cost. Send Easter eCards in 42 languages! 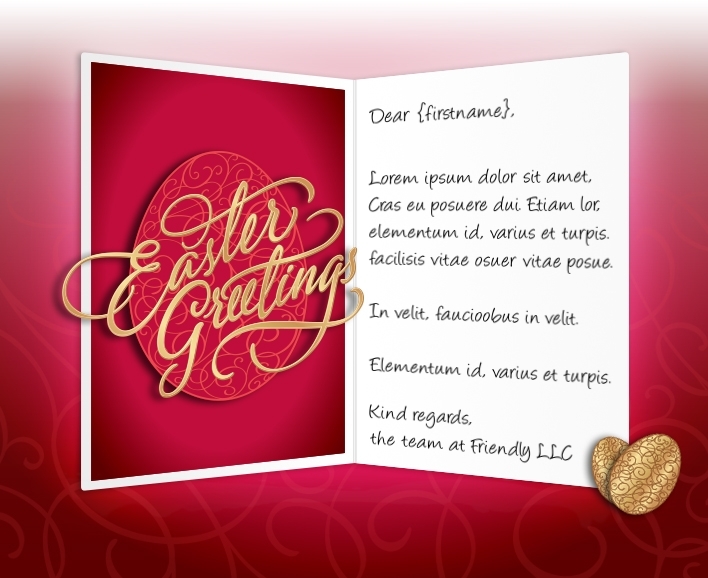 ekarda enables you to send Easter eCards in multiple languages. Whether your contacts speak Italian or Spanish or virtually any European language – you can be confident that your Easter eCard will arrive in your contacts’ inbox in their native language. Select a card from the gallery below and your Easter eCards will be ready to send to your business contacts in minutes – or have a custom eCard designed just for your brand. Add your logo to one of our existing eCards for occasions like Easter, Birthdays, Holidays, Thanksgiving, Christmas and Halloween – or get a custom card made specially inclusive of your logo.